Magoon Creek is a Filer Township Natural Area. It was developed in 1983 with money from the Natural Resources Trust Fund and the cooperation of a number of agencies. There are about 1.5 miles of trail which traverse a surprisingly diverse number of ecosystems, given the small area of the park. 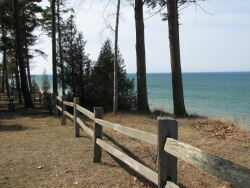 There are interpretive stations, a Lake Michigan beach, and a picnic area. It's a great place for a quick hike or a whole afternoon with the kids. The description begins at the parking lot by the road (so as to follow the numbered signs in order). During the summer there are supposed to be brochures in the mailbox on the north edge of the parking where the trail begins. These booklets are prepared by Filer Township and give information that corresponds to the numbered posts. These trails would be fine for snowshoeing in the winter with the possible exception of the Steep Hill Section. Access- Three parking areas, one by Red Apple Road open year round, two areas inside gate. Restrictions- No camping. Park closes at dusk. Trail Markers- none- paths are well-worn, and the interpretive posts on the main loop are 4x4s with white tops and green numbers. Grades- All north-south trails must climb/descend the hill to the creek. The least steep is the beach route. Ecosystem- sand bluff on the shore of Lake Michigan. Mixed deciduous woods. Creek outlet to Lake Michigan. Wetlands. Second-growth over old homestead sites. Other points of interest- The city of Manistee is a few miles north with small city services. Interpretive- This is one of the nicest interpretive trails in the area. The numbered signs were repainted in 2012, and are mostly in place. The trick is to get a booklet to go with the posts. There are supposed to be some in the white mailbox by the road. However, if there are none there you can also check with the Visitor's Bureau (310 1st St., Manistee, MI 49660, 877-626-4783 or 231-398-9355) or at Filer Township Hall (2505 Filer City Rd, Manistee, MI 49660, 231-723-3138). There are some of the stations where the plant or tree is no longer to be found, and there is no help given in the booklet as to idenfication, so there may be some frustration at some of the posts. However, with 39 numbers and 5 letters with interpretation, there is plenty to see and read about even if you can't find all the items. Be kind to others and return the booklet to the mailbox when you are done! 1. General welcome to the area. 2. White Oak- post is between two 12-inch diameter White Oak. 3. Lichen- patches on tree bark, best ones are behind you. 4. Wintergreen- some on ground. Look for small, dark green, shiny oval leaves. 5. Unevenly aged forest- accurate. 6. Tree with wildlife hole- easily identified. 7. Witch Hazel- right in front of the post. 8. Eastern Hemlock- dark green evergreen with short needles directly in front of post. 9. Red Oak- 24-inch diameter tree to right of post. 10. Sugar Maple- 18-inch diameter tree to left of post. 12. Bearberry Cotoneaster- none visible. 13. Sweetfern- not found, but there is quite a bit on the east side of the trail to the beach. 14. Juniper- low evergreen shrub right in front of the sign. 15. Norway Spruce- post semi-hidden in the small clump of large evergreen trees on the left. 16. Erosion Control- steep eroded trail, some red pine plantings, but trail is in poor condition. 17. Black Oak- Look left away from trail, opposite #16, to see large tree with outspread branches. 18. Bracken Fern- fern with three triangular fronds scattered throughout the park. 19. Abandoned Farm Land- post not found. 20. Former Barn Site- post not found. 21. Black Willow- post not found. 23. White Ash- dead trees. 24. Tamarack or Larch- none visible. 25. Large-toothed Aspen- none visible, but just right of the post is a large Balsam Fir, and there is Ground Pine on the ground. 26. White Pine- large tree in front of the post. 27. Scots Pine- none visible, but there is a 6-inch diamter Black Cherry and a White Birch. 28. Silky Dogwood- none visible. 29. Common Alder- none visible. 30. Apple Orchard- post not found. 31. Staghorn Sumac- post not found. 32. Horse Chestnut- large tree just east of the homestead foundation. 33. Red Maple- post not found. 34. House Foundation- post on ground, foundation easily seen. Lilac by lower door. 35. Downy Serviceberry- post not found. 36. Hawthorn- small tree in front of post. 37. Northern White Cedar- two small trees to right of post. 38. Red Pine- 1-foot diameter tree to left of post. 39. American Beech- post not found, but there are beech directly across the path from post #2. Picnicking- There are a number of picnic tables in a wooded area on the bluff. Several grills. Small pavilion. There is a rail fence to protect people from accidental falls down the steep bank. Scenic Views- Great views of Lake Michigan from the bluff. You can see the Manistee Channel and lights to the north. Swimming- Lake Michigan sand beach at the Magoon Creek outlet is accessible on foot from the main parking area. The creek outlet is sandy and shallow- a nice place for children to wade. There is also a steep unofficial trail to the beach from the picnic area at a break in the fence. Handicap Accessibility- This park is somewhat accessible. The North Trail Section is wide and level, and could certainly be navigated by someone is a sport wheelchair. The Switchbacked Trail Section is wide and level until about post 36, at which point you would need to go back. From the bluff parking lot, you have to change from dirt to natural surface, but it is level to reach the picnic tables. The latrines have a lip (about 2 inches) to change from the gravel path to the cement. Seasonality- parking at Red Apple Road is open all year, but gate with access to other areas is locked in winter. The area is open for hunting. Take proper precautions in season. Restrictions- No ground fires. Park closes at dusk. No lifeguard. From US 31 on the south edge of Manistee, take Red Apple Road west. It will curve southward in 2 miles and Magoon Creek Park is on the right (west) in another 2 miles. Or, from the south, take Fox Farm Road west from US 31, and go 3 miles till reaching Red Apple Road. Turn north, cross Magoon Creek, climb a hill and the park will be on your left.